I'm concerned for the US banking system and the FDIC. With IndyMac gone, the FDIC just lost 10% of its reserves. What happens if Washington Mutual and Bank of America go? The FDIC can only insure so much money. 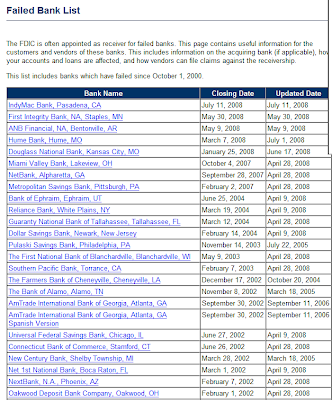 What happens when the FDIC has all of its reserves tapped out from banks going under? Where is our money safe? 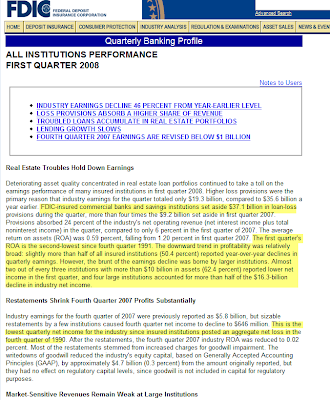 The Federal Deposit Insurance Corporation (FDIC) preserves and promotes public confidence in the U.S. financial system by insuring deposits in banks and thrift institutions for at least $100,000; by identifying, monitoring and addressing risks to the deposit insurance funds; and by limiting the effect on the economy and the financial system when a bank or thrift institution fails. The FDIC insures deposits only. It does not insure securities, mutual funds or similar types of investments that banks and thrift institutions may offer.Customers of the failed institution automatically become customers of the assuming institution. Most of the time, the transition is seamless from the customer's point of view. A look at the balance sheet tells me that if more banks go under, the FDIC will not be able to insure us that $100,000 like they say. $3 trillion divided by $54 billion. Means that the reserves are less than 1.8% of the money value of the insured accounts. For every dollar in an account, there is about 1.8 cents in the FDIC. If there is a banking crisis, the FDIC must sell these T-bills for cash. But the $54 billion on there balance sheets will only last for so long as more banks go under. 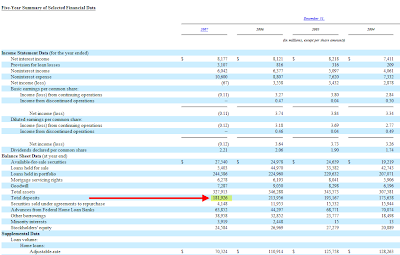 Looking at Washington Mutuals terrible last quarter report you can see it says they have about $181 billion dollars in deposits. Certainly a number the FDIC couldn't insure if there was a run on the bank. For all the Washington Mutual Bankers out there, lets just hope there isn't a run on the bank, or we will have "FINANCIAL ARMAGEDDON!" 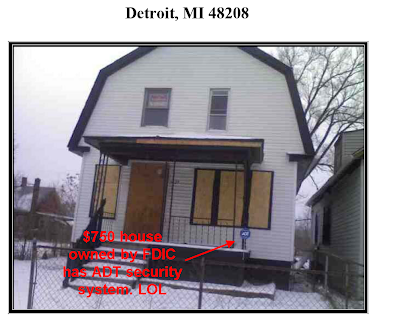 Whats funny is that the Tax on this House is more than 2x the cost of the house. Single Family two-story farm style frame home with vinyl siding, approximately 1,279 squarefeet, age estimated to be 1910, containing 3 bedrooms, 1 bath, unfinished basement located on a30x130 lot. Tax Information:The estimated annual taxes are $2,017.14 per year. Be careful, you may be hauled up by the Securities Exchange for spreading rumours and causing the collapse of WAMU.. I love the name of the bank under IndyMac -- "First Integrity". It's a nice symbol of how these punks in white collars put on a charade to their customers, friends and families about how virtuous they are -- and how the word "integrity" itself means absolutely nothing anymore...at least in the US. Not even for the average Joe or Jane, who would screw their neighbor if nobody was looking and turn around and brag about it to someone else, like they just got one over on the universe or something. In the end, this is payback for all of us -- all the stupid things we did and thought we could get away with. And I don't feel sorry for us, the average Americans, one bit. And by the way, I bank with WAMU. LOL. Only to add I wonder how many banks have integrity in the title? Here in MN where that failed bank was located are a bunch with "integrity" in the title. 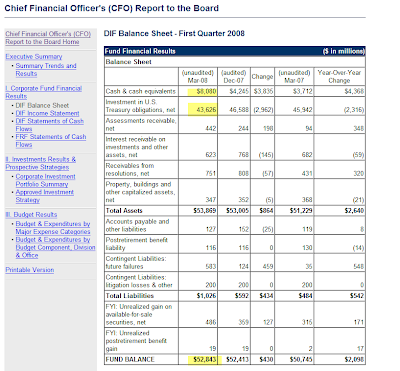 If WM fails, the FDIC will not be on the hook for the entire $181 billion. Only for the deposits that, after the failed bank is wound down (all assets sold off and liabilities paid) are unpaid. The FDIC will increase the premiums charged to for insurance to replenish their insurance fund and will not fail.